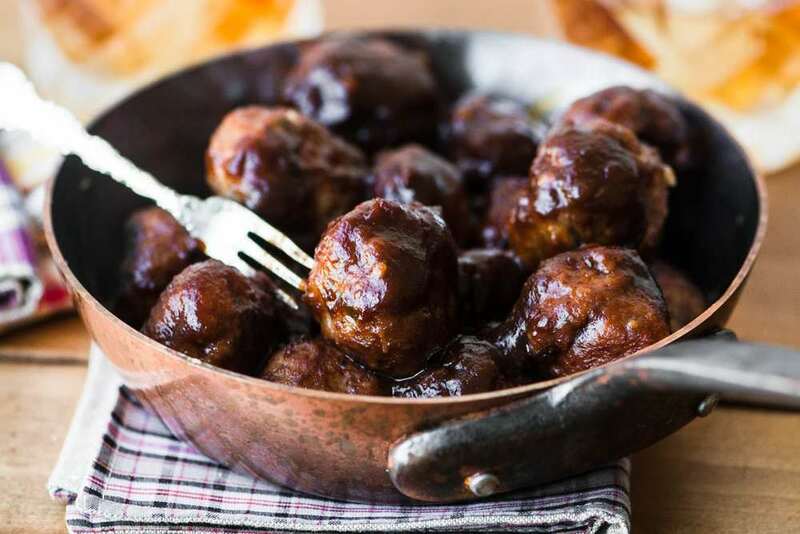 Apple Butter Brandy Meatballs, luscious meatballs smothered in a tangy apple butter brandy sauce ~ serve them with cocktails, or for dinner! Mix the meatball ingredients together gently but thoroughly. I like to use my stand mixer fitted with the paddle attachment, but you can do it by hand, as well. Make sure everything is evenly incorporated into the meat before forming your balls. Use a tablespoon or small scoop to portion out the meatballs. You can them to be cocktail, or bite, sized. I use a rounded tablespoon for each ball. Roll them between your palms until they are smooth and round. Set them on an un-greased cookie sheet. Bake the meatballs for 10 minutes in the preheated oven. To make the sauce, add all the ingredients to a large saucepan and heat, stirring to combine, until the sauce comes to a boil. Lower the heat and let it boil gently for about 5 minutes. Taste to adjust any of the ingredients or seasonings. Combine the meatballs and the sauce together and bring up to a gentle simmer. Cover and let simmer for a few minutes to heat everything through. Serve hot with toothpicks or cocktail forks. If you like you can load everything into a crock pot set on warm and serve from there.